My friend Luvvie and I were speaking at Blogging While Brown this last weekend in New York City, amongst other things and events. 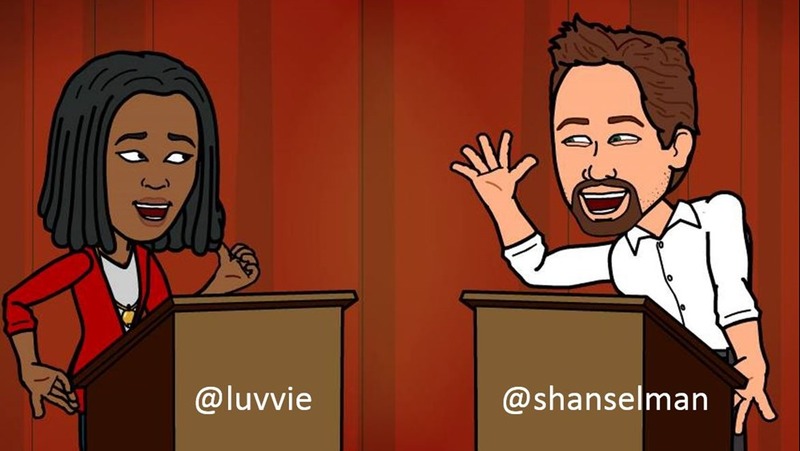 Luvvie and I host a podcast called Ratchet and The Geek. I produce three podcasts - Hanselminutes, This Developer's Life, and Ratchet and The Geek. I do all of these on the side, for fun. Context in NPR terms: If the Hanselminutes podcast is "Fresh Air for Developers", then Ratchet and The Geek is "Car Talk for Techies," while This Developer's Life is a loving homage to This American Life. We did a 5 minute "mini-podcast" live on stage at the beginning of our talk, then talked about how we produce the show and how it goes from concept to topics to a produced and published MP3. For this post I'm focusing on what you'll need for a podcast in terms of Equipment and Publishing. I'm assuming you're able to decide on your own topic/theme and spread the word about your new show. Let's take a look at your options, ranked from Meh, through Good, Better, and Best. 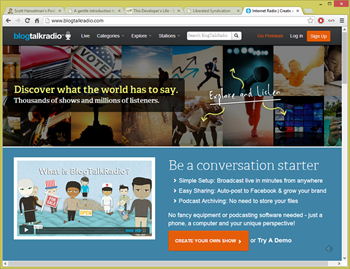 You could use BlogTalkRadio as a super-quick way to jump-start your podcast, but there are some limitations. The benefits are that there's no software to use. It's basically a recorded conference call. They handle call-ins for guests, archiving, delivery and bandwidth. However, it goes up from Free to $39 a month or more quickly. If you are serious about the future of your podcast I recommend that you put a little more work into and and you'll have lots more control and flexibility. If you are going to do Skype-based recordings or online interviews, get yourself a decent USB microphone/headset. These are NOT audiophile or good quality headphones - to be clear - but they are good enough for Skype and they are guaranteed to sound better than talking in to your laptop's tiny microphone hole. Remember, your laptop may have cost $1000 but that tinny microphone hole was only $1 of the price. Have low expectations when using a laptop mic for a podcast. If you get a microphone/headset, get one that's USB to keep the audio digital all the way into the laptop. Don't use 1/8" analog headphone jacks for recording. For Skype interviews I use CallBurner to record the interviewee. Ideally your guest will also have a good USB microphone. Even better if your guest records a local file while you also record the Skype call. More on this technique further down in this post. You may be able to get more flexibility if you move to a portable recorder. You can do interviews with these without carrying your laptop. You can also use your phone or tablet if you like. Ideally you'll want to make WAV files rather than MP3s. If you're editing your podcast later a WAV file will sound better while editing and won't lose quality. An MP3 is already compressed and then will get compressed again when you save your final podcast. 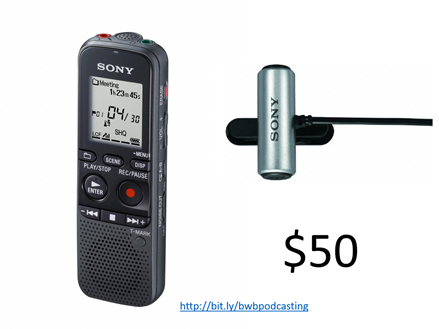 You can also add a small Lavalier (clip on) microphone if you like, then plug it into the portable recorder to better isolate sound for your interviews. 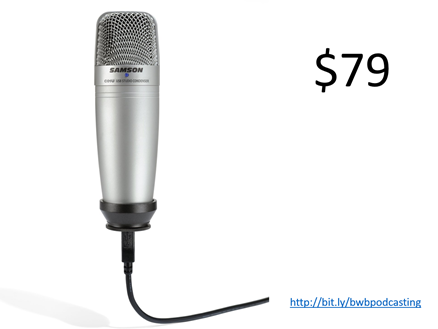 If you've got $80, consider a Samson C01UCW USB Mic or similar. This is an extremely competent mic that plugs directly into your computer's USB port. You can record into Audacity or Adobe Audition or even iMovie or Garage Band directly. For one or two person talk shows this is a great mic to start with. Also consider your room configuration. If you have a square room with stone walls and wood floors, your listeners will be able to hear every bump in that echo-y environment. I use a Portable Vocal Booth from RealTraps when sound quality really counts. This is useful for screencasts and voice-over work in a noisy environment. I say "best" but I'm assuming you don't have an actual recording studio available to you. This is the setup that I use on all my podcasts. 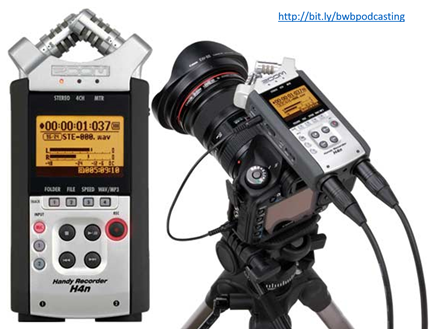 I use a Zoom H4N portable recorder. It uses an SD card to store the WAV files. It comes with two small mics at the top for starters, but then lets you grow by adding either microphones with 1/4" jacks or studio quality mics with XLR connectors. I recommend Shure microphones. 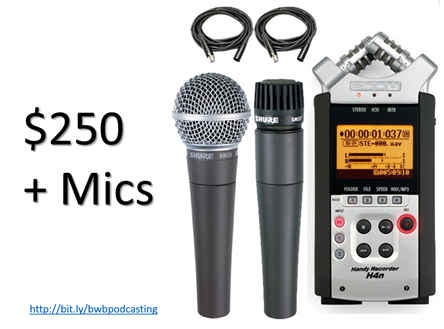 Two Shure PG48-XLRs with cables paired with the Zoom H4N will make great sounding podcasts. All the very best episodes of This Developer's Life were recorded like this. All the episodes of Hanselminutes where the guest wasn't on Skype were recorded in person with this very setup. The Zoom also has the benefit of improving your YouTube videos. You can mount it directly to a DSLR camera with video capabilities and greatly augment the resulting video's sound quality. Again, the components in a DSLR are optimized for visuals, not audio. Luvvie and I live in different time zones so we record local files with our portable rigs PLUS we Skype each other and record the call with CallBurner. This gives me THREE files. Why three files? Well, one high quality of my recorded locally as a WAV. One of my co-host recorded in high quality as a WAV and one of BOTH of us. The trick is that we don't use the phone/Skype track. The phone track is just for lining up the two other tracks. This makes it sound like my co-host and I are in the same room together. See the three files below. My co-host is on top - notice her track is quiet. I'm on the bottom. The phone track is in the middle. 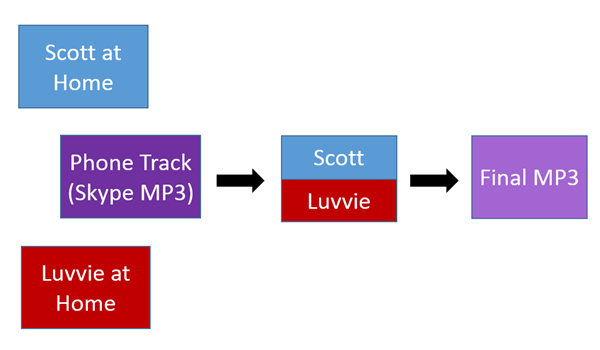 Since these are separate tracks I can adjust Luvvie's track to make it louder and better match my track's volume. I move our tracks around using the phone/Skype track as a guide. It tells me what we're supposed to sound like and gets our conversation in Sync. When I feel we are in sync, I mute the Skype track and listen to us talk. 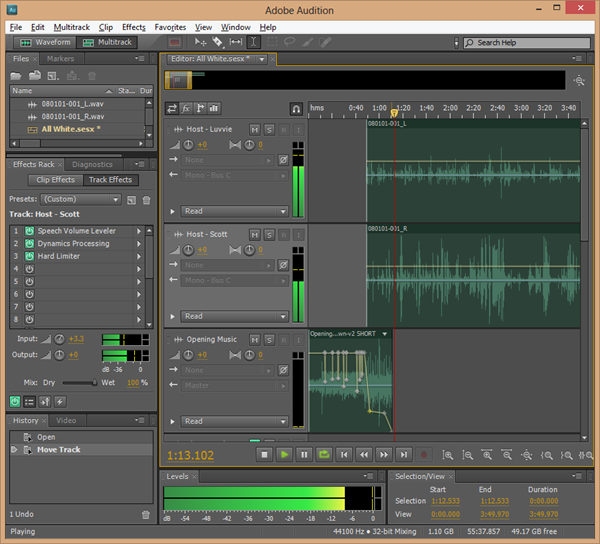 For complex show I'll use Adobe Audition and use the Effects Rack. I use a Speech Volume Leveler and a "Hard Limiter" to keep the voices at a strong, but not overpowering level. There are LOTS of great Tutorials online to show you how to use tools like Audacity and Audition. It's like PhotoShop for sound! There are layers and filters and effects. Thinking about it this way greatly helped my mental block. We recommend using LibSyn for your hosting and publishing your podcasts. If you are more technical you can certainly use Amazon S3, Azure Blobs or just your own existing host if you like. For shows like Hanselminutes that have almost 30,000 megabytes of shows, we use S3. Both Ratchet and The Geek and This Developer's Life use LibSyn. LibSyn offers a simple platform for publishing and feed creation. It also has fantastic stats and can even make mobile apps for your shows if you want. 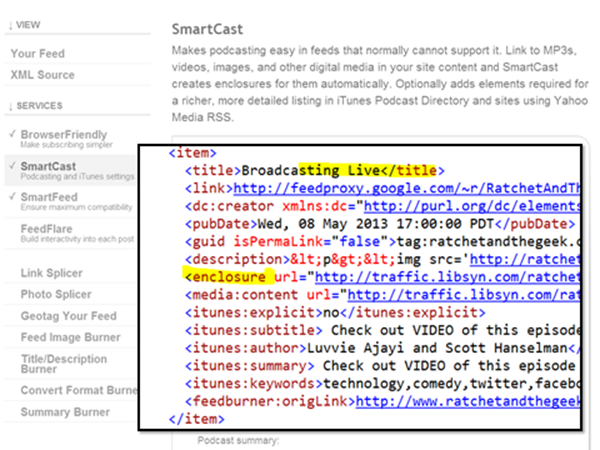 Podcast feeds are just like RSS feeds except they also include an "enclosure" tag. Services like FeedBurner and FeedBlitz can add this tag for you if your blog doesn't support it directly. While it's unclear how long FeedBurner will last, We use it for its easy podcast creation ability. 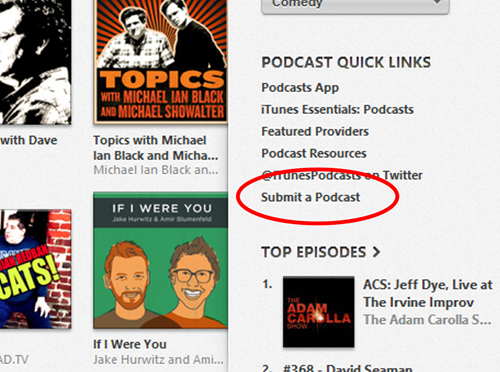 Make sure you submit your Podcast to iTunes and Windows Phone/Zune. I also suggest telling Rob Greenlee (the manager of the Windows Phone/Xbox/Zune podcasts) on Twitter about your show). BlackBerry - You can submit your podcast by going to thePodcast submission page and creating a RIM podcast account. Stitcher - is a radio-like service that allows you to submit your audio podcast to. Submit your audio only podcast at the Content Partner page. Tunein Radio - You can submit your Podcast to Tunein by sending an email to Broadcast Support. DoubleTwist - Submit your show by emailing Support with your show's name, RSS, and description. Ultimately you need an MP3 that shows up in a feed and a website to promote it. Everything you can do on top of this will only help you! Think about sound quality, topic quality, consistency, website quality, and technical details. Sponsor: Big thanks to CodeProject for sponsoring the feed this week! What you can do with 215+ million business records? Dig into the data in the D&B Developer Challenge and post an article on CodeProject about what you could do with the data. Over $40,000 in prizes total are up for grabs. Check it out! Just curious, what is the reason for choosing LibSyn for Ratchet and the Geek and This Developer's Life over S3 since that is what you already had setup for Hanselminutes? Ease of use? Cost? Thanks Scott. This is fantastic. Can you speak to the time required for recording + editing + distributing a typical episode of your podcast? I think there is an intimidation factor for the effort required. Also - you don't mention your intro track music and voiceover as part of the process? The Samson C01U is a fantastic mic. I picked it up at Best Buy a few years ago for around $60 and it's been a great investment for being guests on podcasts, but also for conference calls without having to wear a headset or anything. The DSLR mountable ZH4N looks awesome, though! Great post! Great recap. I never about the portable sound booth. 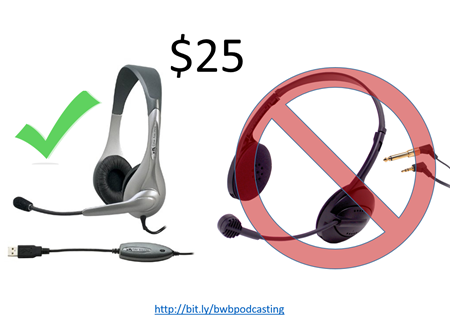 And I use Pamela for Skype recording but it costed about $20 or so - CallBurner looks like a great free option. One thing I like about Pamela is it records each voice in a different stereo track - does CallBurner do that? One thing that took me a few shows to develop was customized sound filters for my co host and I, in addition to the hard limiter you mention. We use background music so I had to adjust the equalizer so that our voices lay gently on top of them, but the two voices don't clash with each other. It's something that takes time I never have to adjust it again. Even when I have guests, usually one filter (the one for my deeper voice) or the other (for my cohosts higher voice) can be used as the basis. Scott, are you going to be at Build this week? We always enjoy your presentations. I'd like to recommend Reaper for the DAW (digital audio workstation) in place of audacity or adobe audition. It is very inexpensive compared to pro tools, sonar, etc and has a very generous licensing model (they only nag you for a few seconds if you haven't purchased after the trial). $225 for commercial license and $60 for discounted. Check it out here www.reaper.fm. I have to respectfully disagree with the notion that you can't use your 1/8" jacks (falling back to my broadcast background here). On short cable runs, there's no real issue there. The room noise is going to be more of an issue than anything created by using analog signals. I also disagree that the Skype feed isn't enough. I've always used two computers: One to record on, and one to act as a Skype computer. The Skype computer outputs the Skype sound (which doesn't include my voice) to a little Mackie mixer. The mixer also takes my microphone as an input, and the main output goes to the recording computer. The mixer uses an aux send to loop my mic back to the input of the Skype computer, so the other kids can hear what I'm saying through their mic. Hopefully, you're encoding your podcast as a 64k mono file, which is more than good enough, and apply a little compression (as in dynamic range, not data compression) to get a nice level and "radio" sound. I've never understood why people want to make talking heads stereo. 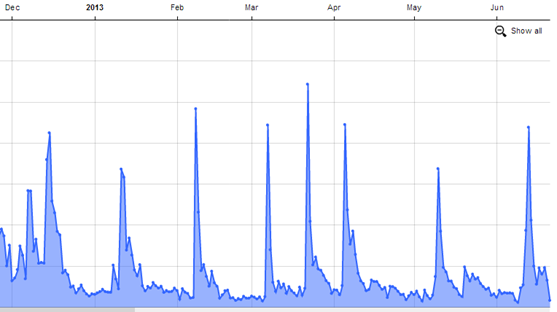 With people downloading right to their phone, over-the-air even, I think we should be a little bandwidth sensitive. We are using Libsyn, which I found to be very nice. This plugin is awesome. You can basically set it up to get the file from Libsyn and serve it in your post as well as create the RSS feed for iTunes for you. Co-Sign on Reaper for multi-tracking audio on all platforms. Windows users should grap a copy of Cool Edit 2K or Sound Forge 5 but there are plenty of other options. Plenty of Linux tools as well. Harrison Mix is a good multitrack program based on Ardour. How you manage when both parties are speaking at same time. not even speaking but arguing for a long run. Still you use separate .wav's and mix it within different time line or go to skype recordings. Bart - LibSyn is fantastic. If they were around when I started Hanselminutes I would have used them. Sumit - Once they are lined up, folks can feel free to argue. Great writeup - thanks, Scott. +1 on the Zoom H4N. 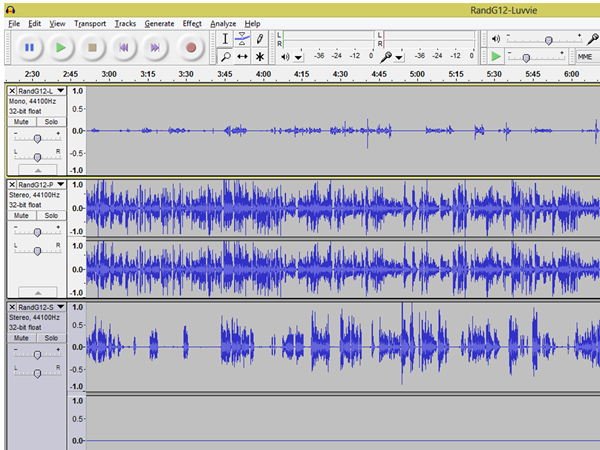 For Skype-based interviews, I use MP3 Skype Recorder, which automatically records the parties into separate left and right audio channels for easy editing later (and is free). Thanks for this, Scott. My group has recently been struggling with recording professionally sounding audio, and I think you've given us the solution here. I haven't done any podcasting, but I have tied my ham radio gear to my PC in the past to record stuff. I used a USB mixer that accepts audio from my mic and radio then feeds it into my PC. I really like the GoldLine by Heil Sound. The Heil mics for amateur radio usually have two elements, one tailored for full range broadcast audio and one for narrow range that is designed to help punch through noisy conditions. The wide setting sounds awesome on it's own but with a decent eq you can tailor the audio even more. Scott: How do you handle copyrights for music tracks used in your products? TIA. ...and by "products" I meant podcasts.